My weekly review and recap. Also Read: The Man from U.N.C.L.E. #4 – The Dagger Affair by David McDaniel. You know how some days you just don’t want to read any of the books you’re currently reading? I had one of those on Saturday and grabbed this out of my TBR stack to take to work. I picked up a stash of these old TV tie-ins at a used bookstore a couple of years ago, and they’re wonderful brain candy. This one was actually surprisingly good – all the characters were solid, including the creepy, creepy Thrush San Fransisco couple, and the plot carried itself along at a good clip. The ending fell apart a little, but then, it’s not like you’re afraid Napoleon or Illya are going to die or anything. It reminded me of the best episodes of season one and two, which is all I can ask for from a tie-in novel. Also also read: “The Devil in Gaylord’s Creek” by Sarah Monette, available free online at Fantasy Magazine. (Monette is one of my favorite authors; expect to see a link here every time she has a new story up somewhere.) This is a great short about loss and devastation and monsters – go, read. Reviewed: Libra by Don DeLillo (New to Me), Rope of Thorns by Gemma Files (Hot Off the Press), Quarter Share by Nathan Lowell (New to Me). It was a finishing week. In the rest of the world: I am horribly, horribly sad that I am not able to attend the American Library Association conference this year in New Orleans. Exciting stuff is happening – 3M is unveiling their new digital library platform (a competitor to Overdrive, at last! ), the director of the Wikimedia Foundation will be speaking (I can’t wait to see all the tweets from that program), and of course all those free books I’m missing out on!… (I’m consoling myself with egalleys from Net Galley). If you’re also a librarian, or you’re just interested in what libraries do, track the #ala11 tag on Twitter and elsewhere June 23-28 and see what all the fuss is about. The weekly recap, books and more. Also Read: Medieval Gentlewoman by ffiona Swabey. This book was perfect for what I wanted it to be – I’m thinking about writing a novel set in either a historical or a fantasy universe based around a young widow who’s the head of a household, and I needed some more background on just what sort of things she’d be responsible for. Medieval Gentlewoman is a sort of pseudo-biography of a widowed head of household, a description of how late medieval manors and estates worked and how women held positions of responsibility even though they tend to vanish in traditional history. It was pretty dry going, though, and I wouldn’t recommend it for someone looking for some fun history reading. Also also read: Six Months, Three Days by Charlie Jane Anders, available online at Tor.com. A wonderful short story about potential and futures and certainty. I loved it, you should give it a try. In the Wider World: Hopeful Librarian is still hopeful, although library jobs are still thin on the ground. If anybody out there needs a highly-motivated, well-read reference librarian, give me a yell. A blog recommendation and a free book giveaway all in one post! A friend linked me to Juciliciousss Reviews’ book giveaway, which is awesome in itself — enter a drawing for a box of 8 or 9 YA books shoved in a box and sent to your home — but I clicked through to the main page, and you know, the blog is pretty great, too. I love the occasional YA book, particularly SF or fantasy. (I think some of the most unique and interesting SF is getting written as YA right now.) And now I will have another source to browse through when looking for new books! Wait…given my current to-read list, that might not be a good idea. Oh, well. Koha blog. (n.d.). 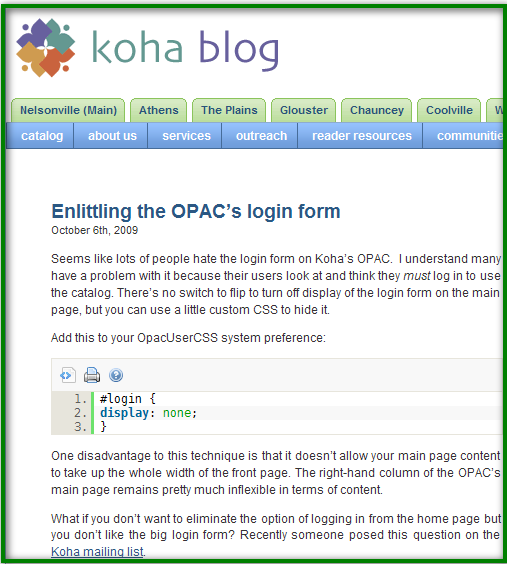 Retrieved from http://www.myacpl.org/koha/. The great thing about open source software like Koha is that, with the right application of effort, you can make it do whatever you want it to. And in the true spirit of open source, the folks at the Nelsonville Public Library are sharing their efforts with the rest of the library community, in simple, straightforward explanations that anyone with a minimum of programming experience can implement. This kind of stuff (although possibly not these exact tweaks) is also available at the Koha developer’s wiki, but the advantage of Koha Blog is in its simplicity and in the fact that it’s written by librarians for librarians: knowing how to add extra content blocks is useful, but knowing what you’d use them for is even more useful, as in this example.